We’re impressed with the Nest Cam IQ. It’s a high quality camera that recognizes faces. The camera will email you when it sees someone. That’s pretty innovative. The Nest Cam IQ comes without any mounts in the box. There’s a round weighted base which the camera is attached to. That’s fine for those wanting to place the camera on a flat surface like a table or shelf. If that’s where you need the camera to be, stop here, thanks for coming by. The weighted base makes for an excellent stand on a flat surface. The Nest Cam IQ is seated on an adjustable pivot at the top of that stand so you can angle it however you want. No additional mounts are needed if a shelf or table is in your plans. But what if you want to mount the Nest Cam IQ to a wall? Maybe a window? We have an answer for that. How about a ceiling? No good answer for that as this camera does not support the rotate image option found on other Nest Cam and DropCam models. Note the bottom of the stand on the Nest Cam IQ. It has a screw hole. That hole is a common mounting pattern or pattern. It’s the 1/4″ – 20 threaded screw pattern common to tripods. This opens up the Nest Cam IQ to a wide array of mounts and tripods. This is similar to what they did with mounts for the original Nest Cam. 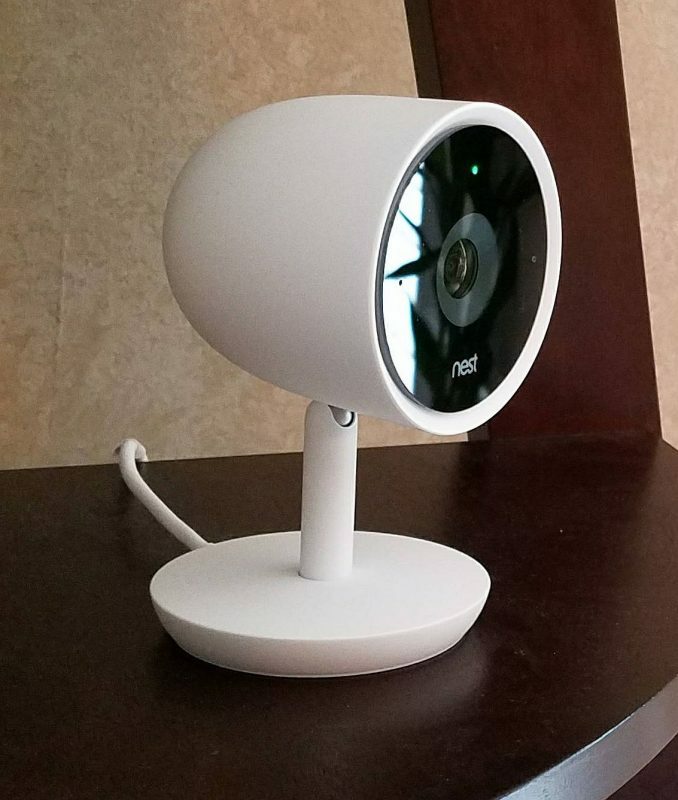 The Nest Cam IQ is a larger camera. Certainly larger than the Nest Cam. It measures 4.9 x 2.9 x 2.9 inches and weighs over 12 ounces. A substantial mount is needed to hold a camera with this weight and size. Want to mount the Nest Cam IQ onto a wall? Consider Wasserstein Wall Mount for Nest Cam IQ. It’s a magnetic wall mount. Use this mount on a wall with screws or attach it to a metal surface using the built-in magnetic feature. The mount has a 1/4″ – 20 threaded screw that attaches to the bottom of the existing Nest Cam IQ stand. Just screw the camera onto the mounting plate and you’re all set. We alluded to the potential of attaching a Nest Cam IQ to a window. Consider deploying the Fat Gecko Mini Camera and Camcorder Mount. It’s a well made mount that adjusts at the base and tip sufficiently to get the right angle for the best video when mounted on a window. The three-inch suction cup has a vacuum lock for a more secure hold. There’s an extension arm included with the mount that we suggest using to make it easier to get the right angle. It’s going to attach to the camera using the tripod hole on the bottom. The mount is made to hold up to four pounds, so the Nest Cam IQ won’t be an issue. A very innovative offering from Wasserstein is the Nest IQ AC Outlet Mount. We have tried these mounts before for the original Nest Cam and they are extraordinarily convenient. Mounting the camera somewhat flush to the outlet, it’s not an obvious place for someone to look for a security camera. The mount plugs into an AC outlet and includes a 12 inch cable to power the Nest Cam IQ. The mount accommodates a 130 degree swivel so you can move it from side to side to get a better angle. Also from Wasserstein is the Versatile Quadpod Mount for the Nest Cam IQ. Featuring flexible legs at the base, this mount attaches via the tripod hole on the Nest Cam IQ. This mount can act as a mini tripod or, even better, you can bend the lower legs to wrap it around anything. Great for placing the camera in places not traditionally accessible with a standard mount. Wrap the legs around a chair leg, shelf post of curtain rod. This is a great mount for turning the Nest Cam IQ into a stealth surveillance solution. Who’s going to look at a curtain rod for a security camera? Any of these three mounts will work well and allow you to use the Nest Cam IQ on places you may not have thought possible. All are well made and support the screw hole on the bottom of the camera.